A restful beach-themed toy from the creator of Metamorphabet. 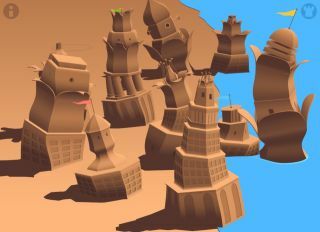 I didn’t know that Sandcastles—an absolutely charming digital toy which caught my eye on itch.io—was by Patrick Smith’s Vectorpark when I started playing it. I really should have. It has that same attractive odd quality as his previous projects like Metamorphabet and Windosill. As with other Vectorpark projects I was drawn in by the clarity of the shapes and the brightness of the colours but then had a lovely time discovering unexpected treats as I interacted with it. Sandcastles is possibly the most straightforward of the Vectorpark projects I’ve played. You click on the sand and hold the left mouse button down as you trace a line upward, conjuring a complicated sand structure as you do so. They’re less like sand and more like sandy jellies which you can bend, stretch or truncate. You only have a limited window of time in which to drag these sand metropolises into being before a wave sweeps in. Everything gradually sinks below the surface of the water and the wave recedes, leaving a blank slate. Your only interaction options are in shaping the castles, both by your mouse sweeps and by which architectural styles you enable in the menu. I like to switch everything on and enjoy the mishmash of forms that throws out. It’s a game in the sense that you play on the tiny segment of beach and feel a sense of racing against the tide, but it’s also a relaxation tool. The simple interaction is very soothing when you choose to build but I’ve actually had Sandcastles running while I write this just to enjoy the sound of the waves. There's a free browser version and the downloadable $3 version on itch.io.